Hello Summer!! After a winter that never wanted to end (at least here in the Great Lakes region), we kinda skipped spring and went right to summer. I don’t remember temps in the 80’s and 90’s in May or early June in a long time. It was also general consensus among local runners that this quick. drastic change in temps really can mess with the body. If we have the chance to go through the regular season changes, the body can get accustomed to the temperatures gradually. I know that for myself, the heat can wreck havoc on my stomach! If you ask any runner, keeping the stomach happy is key to any good run or race. The spring summer transition is always the worst for me. So bad that my morning running partner has taken it upon herself to make sure that our morning routes from her house have bathrooms strategically placed along the way. 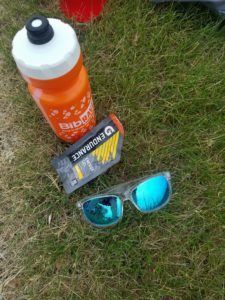 For the last few years, I have dealt with stomach issues and tried many different sources of hydration and fuel to get me through many miles on my feet. 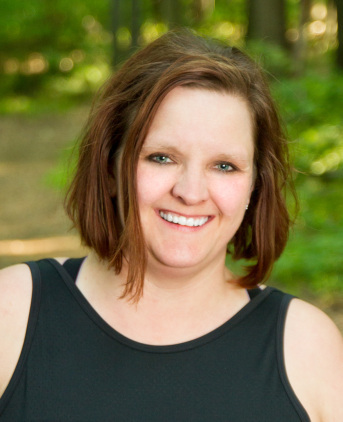 I have learned (many times the hard way) what does NOT work for me, and always get excited when I find products that do work for me. 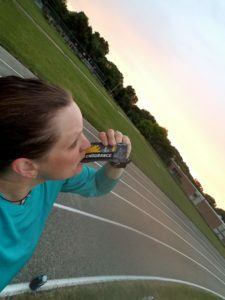 I am one of those runners who brings all of my own fuel to races, and generally ALWAYS just run through aid stations because most half marathons in this area use Gatorade on the course. This does not work for me! a few sips of Gatorade was usually enough to send my stomach into a tailspin and make the several miles not so pleasant. 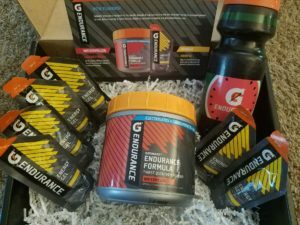 When I was presented with the opportunity to try out the Newly formulated Watermelon Endurance formula from Gatorade, I said no. Gatorade does not work for me. When it was explained to me that this was a new formula and was designed to be better on the stomach, I was still hesitant.. but decided to give it a try. I didn’t have a lot of faith, but I decided to give it a whirl. A few weeks ago, my shipment arrived! I was excited to see that, along with my Watermelon Endurance, I received 6 of the Mango Energy Gels and an awesome watermelon water bottle!! Since I wanted to be smart about testing this out, not sure how my stomach was going to handle it, I mixed myself up a bottle right away! Besides, it was watermelon flavor! What better way to hydrate on a warm (early) summer day that with a cold watermelon beverage! No running, no workout, just me and my Gatorade. The first thing that I noticed was the flavor was a little strong for my liking. This did not surprise me as I generally dilute my beverages a little. A little extra water and I was in business. The nice light watermelon flavor was a great thirst quencher! Half hour later, no stomach issues! We might have a winner here! Over the next few weeks I tried it a few more times between running and cycling classes. After playing with the ratio of mix to water, I found what worked for me. So far, I have not had any stomach issues! Now time to check out the Mango Energy gels! I normally don’t do any type of gels because they are usually too thick and sticky for me… not to mention too sweet! I am a sucker for anything mango, so part of me was excited to try these! Next up, 5am track workout with the girls. It was another warm humid morning and the training calendar had a tough workout for me. After a few warm-up laps, I grabbed my Mango Gel. One major plus to these gels that I noticed here was that these were not at all thick and sticky like most others that I have tried! It had a great flavor and didn’t taste nearly as sweet as most others. I powered through the rest of my workout with that extra bounce in my step! 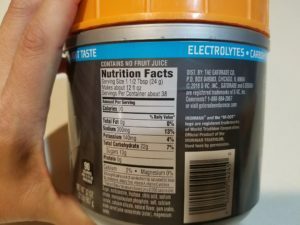 Over the last week, I have had the chance to try out both of these Gatorade products a bit more. The gels have been awesome! 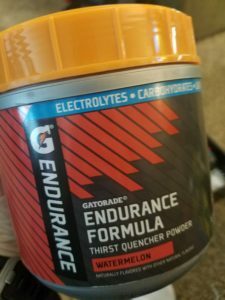 The only thing that I noticed with the Watermelon Endurance is that I have experienced a few headaches after drinking it. I am thinking that it might be the sugars in the formula that are triggering them, but I am not sure. This product does have a bit more sugar in it than most of there products that I use, so that might be the issues. I am going to play with it a bit more and see if I can figure out when it happens and when it doesn’t. 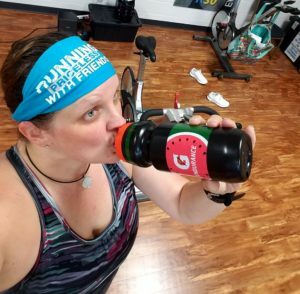 Overall, I give the Watermelon Endurance a thumbs up!! For the first time in years, I know that I can grab this new improved formula and it won’t give me stomach issues!